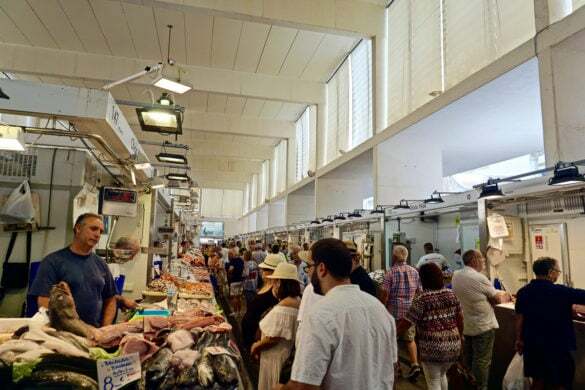 Find out the top things to do, the best restaurants, hotels, and some insider information to help you plan your visit to Cadiz in Andalucia, Spain. Vivid green water dotted with fishing boats, white buildings as far as the eye can see, skinny cobbled streets running from one side of the peninsula to the other, and a buzzy, local vibe with characterful tapas bars on street corners. After falling in love with Cádiz on my first visit, I just know it’s somewhere I’ll return to again and again. It’s historic. It’s quaint. It’s charming. And however hard I try to describe why it’s special, I think it’s the photos that really tell the story. Is Cadiz worth a visit? Yes. Definitely. After my adventures in Ronda, Nerja, Malaga and Antequera in Andalucia, it’s time to take a tour of Cadiz! Over the years it was one of Europe’s most important ports, with trading links to America. For somewhere relatively small, it really does have a fascinating past, and one you can really get under the skin of! But for those less interested in the past, there’s plenty more to this city. There are several beautiful beaches, including La Caleta right in the centre. There are wiggly narrow streets, beautiful tree-lined plazas, fountains, great restaurants and sensational views. It’s somewhere you could create an itinerary packed with tours and museum visits, or just spend a few days eating, drinking and exploring at your own pace. And that’s exactly why I loved it. While some of Spain’s larger cities are becoming more multi-cultural, Cadiz has retained a truly Spanish flavour. Locals seem to be connected, only walking a few paces before bumping into someone they know and catching up over a cerveza or a coffee! 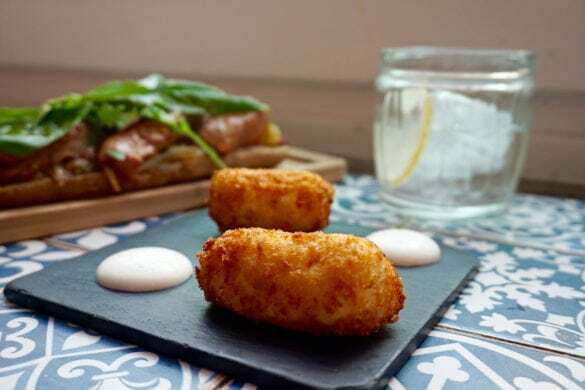 Tapas bars go back several generations, and despite some restaurants specialising in modern Spanish cuisine, there are still plenty with menus virtually unchanged from 50 years ago. Cadiz, Spain: Where Is Cadiz And How Do You Get There? 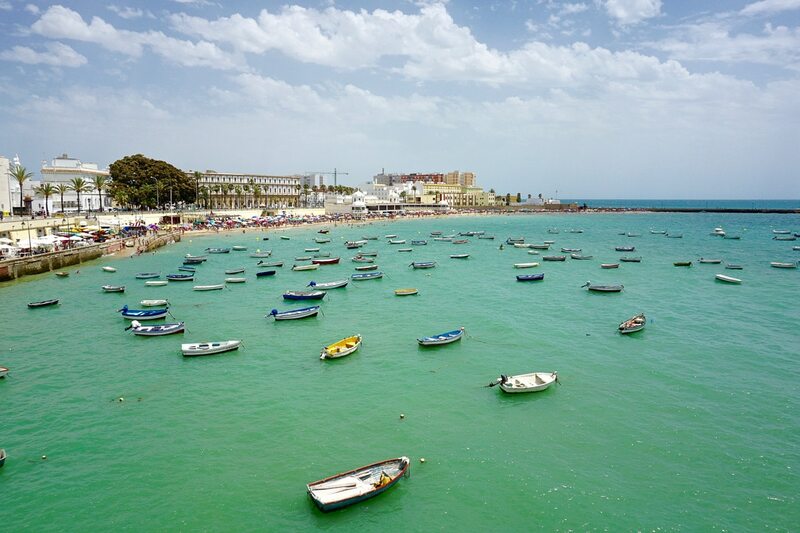 Cadiz is located on the south coast of Spain, close to Gibraltar. The most direct route from the UK, is to fly with Ryanair from London Stansted to Jerez, which is just 33 minutes away by car. It’s also quite easy to fly from the UK to Seville and catch the train (1 hour 40) or hire a car. If you’re already heading to the south of Spain, Cadiz makes a great day trip, and the high-speed rail network makes it easy to get around. Southern Spain benefits from pretty warm temperatures all year around. Even in mid-winter it can be as warm as 16 or 17 degrees. The time you may find the weather uncomfortable is more likely to be in the summer months when temperatures can reach as high as 38-40 degrees. It was around 39 degrees during my visit in late June, so be prepared! 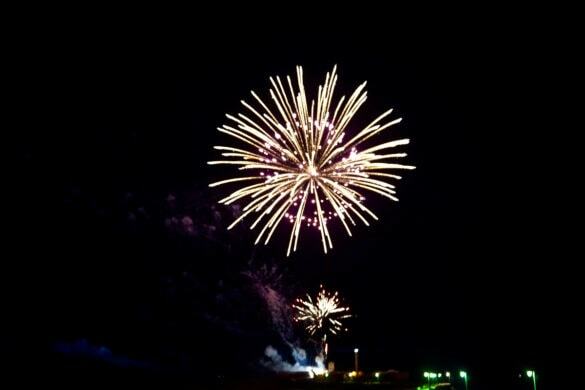 Spain knows how to party, so don’t be surprised to see a few festivals or celebrations during your visit. 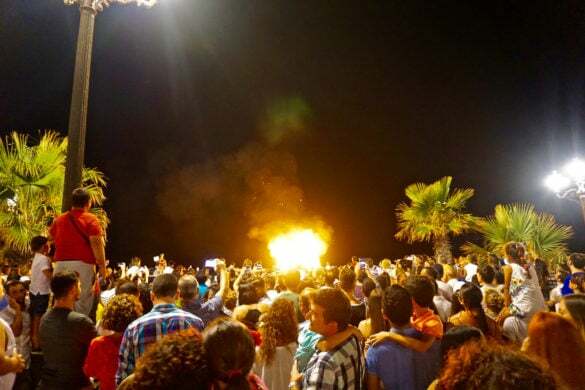 During my trip in June there was a huge celebration for San Juan, which included fireworks over the sea, and a religious festival with parades winding their way through the city. Cadiz is particularly famous for its Carnival in February. There are also plenty of celebrations during Semana Santa (Holy Week). Just remember, the city will be extra busy during these periods, and accommodation may be a bit pricier, and harder to find! 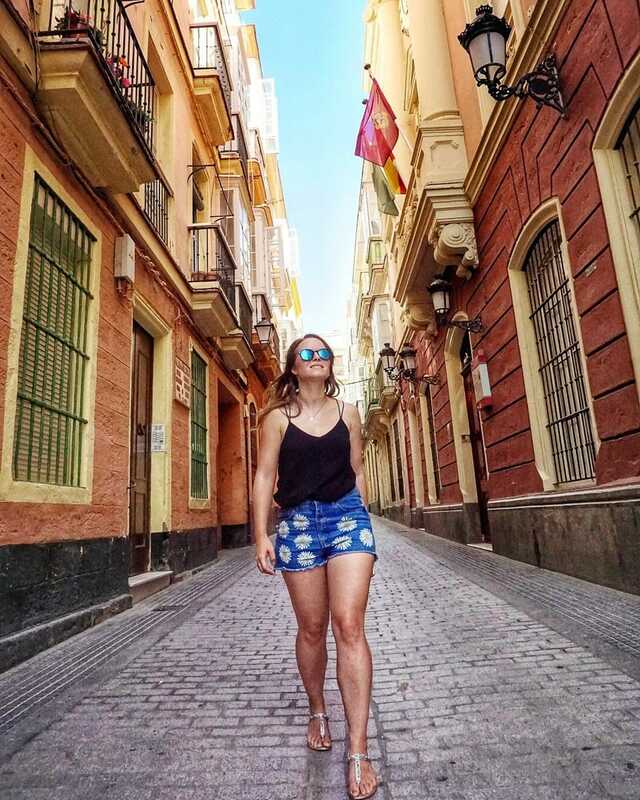 Food Tour Of Cadiz: Always one of my absolute favourite ways to get to know a city, the guys from Pancho Tours and Cadizfornia Tours are young, fun, and so passionate about their home city. They know which bars have interesting stories to tell, where to get the best fried fish, and where you should spend your Euros for the rest of your stay! Roman Theatre: I couldn’t believe it when I was walking down the main street with the sea on my left and I spotted the remains of a large Roman amphitheatre. Free to visit, it’s amazing to walk all over this piece of history. The museum is very well formatted too. 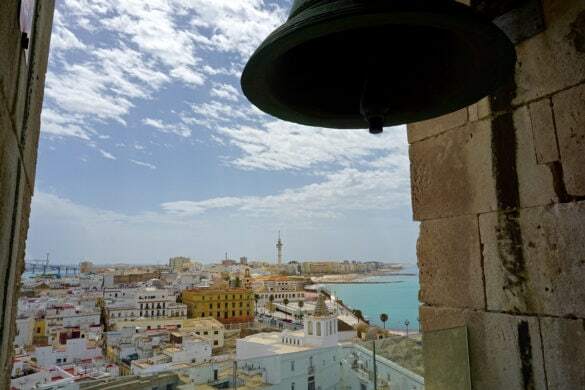 Climb Torre Tavira And Check Out The Camera Oscura: Recommended by everyone I met, Tavira Tower is the highest point in the city and offers incredible panoramic views. You’ll need to book onto a guided tour in order to marvel at the periscope images of the city projected onto the camera oscura. Climb Cadiz Cathedral Tower: So you’ve taken in the panoramic views of the city from Torre Tavira, now compare them with the views from the top of the cathedral. Personally, I preferred the views from up here, as I loved snapping photos with the bells silhouetted against the incredible city backdrop. I also really liked being closer to the water. 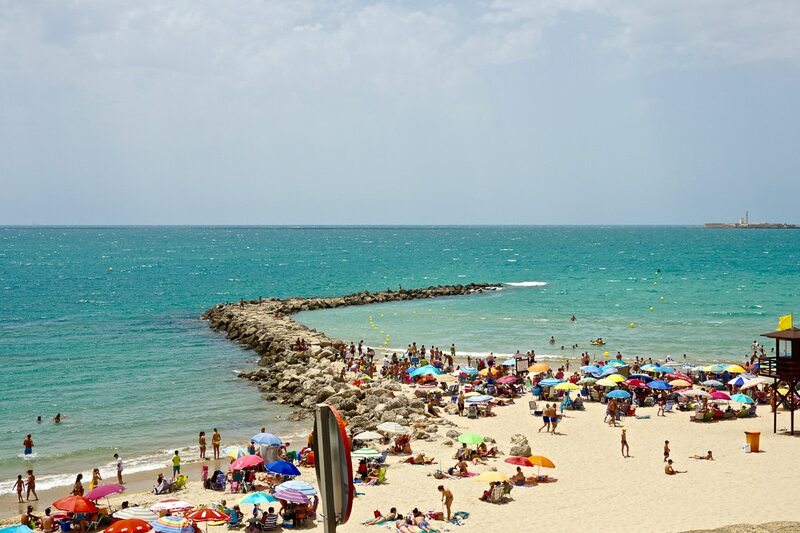 Hit The Beach: The beaches around Cadiz have won plenty of awards, including being recognised as one of Europe’s best urban beaches. La Caleta at one end of the peninsula is a popular spot with both tourists and locals, but it can get a little crowded. If you want to spread out, head just a few minutes into the new city to Santa María Del Mar or La Victoria. 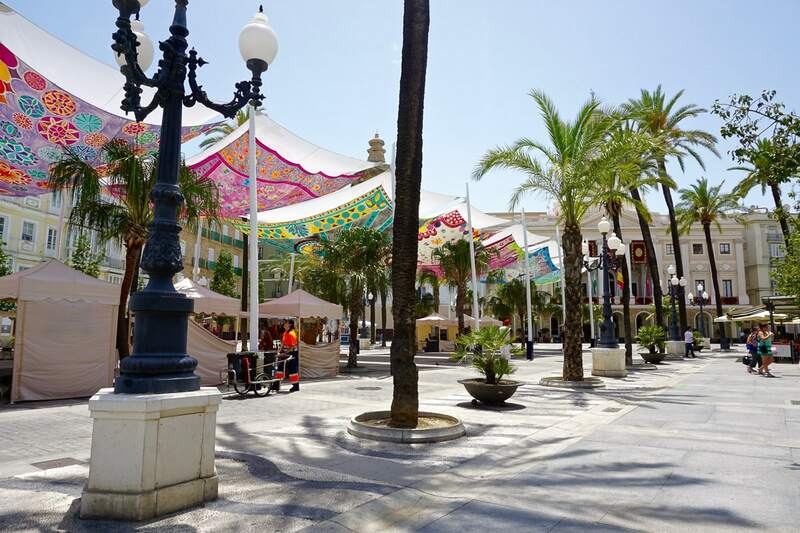 Explore The Shops: While there are a few streets around Calle Columela with well-known stores such as Zara, Desigual and Mango, Cadiz has lots of boutiques, gift shops and food stores. The fun comes in discovering them as you explore the city on foot. 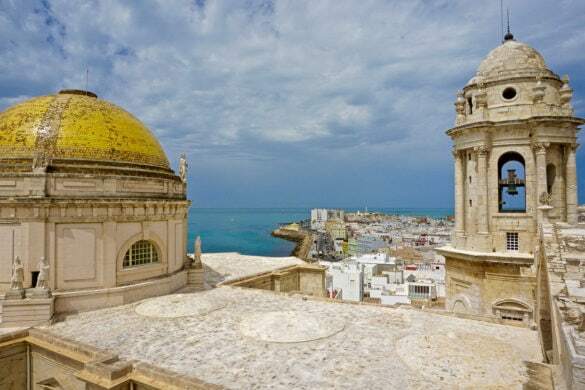 Tour Cadiz by bus: Hop on board and explore the city from the comfort of your seat, seeing all the key sights including La Caleta Beach, the Roman ruins and more! When you fancy a break hop off, then hop back on and head to the next stop! Visit Mercado Central – A buzzy market in Plaza Libertad with a truly local vibe. You’ll be able to watch the locals buying their fish and fresh produce, and check out some of the strange sea creatures for yourself! 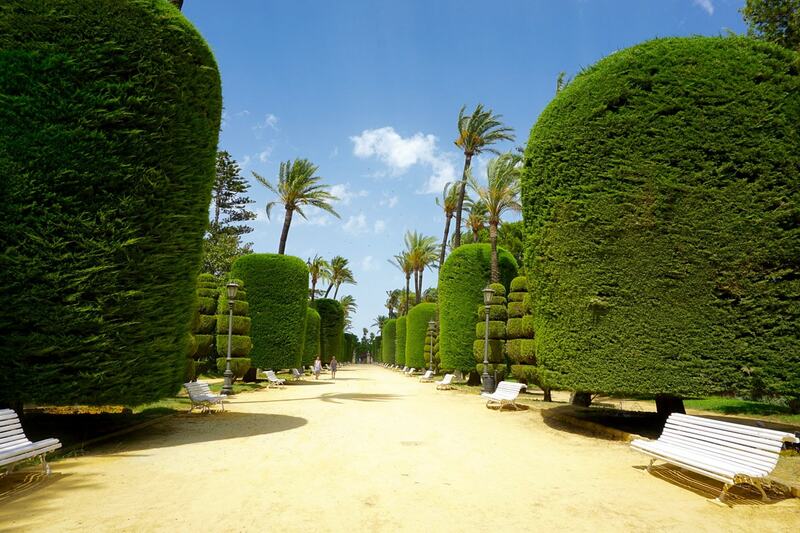 Relax In Parque Genovés: With a water feature, plenty of birds, beautifully manicured trees, exotic colourful flowers and a café, it’s not hard to understand why several locals I spoke to said this was their fave spot in Cadiz. Walk The Entire Peninsula: As mentioned, you really don’t have to race around Cadiz to have a good time! One of my favourite things to do was wander the entire peninsula, starting at Plaza de San Juan de Dios, passing Parque Genovés, La Caleta Beach, the Cathedral, Roman Theatre and more. 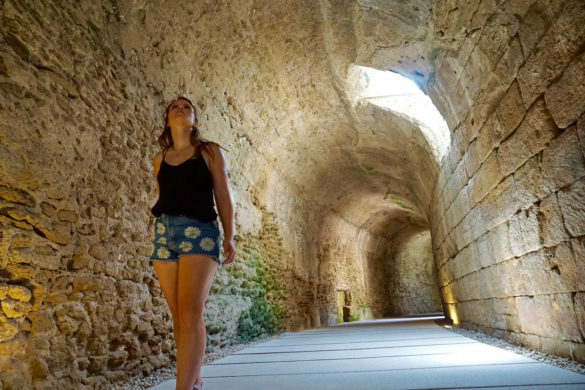 Tour The Underground Caves And Catacombs – It’s thought that there are well over 50km of ancient passages, caves and burial sites under Cadiz, some dating back 3,000 years to when the city was founded! There are plenty of remains from Roman times and the 16-18th centuries when there was almost as much happening underground as above. The best way to experience it is to head off on a tour of the city’s caves, La Casa Del Pirata and the Catacumbas Del Beaterio. Visit The Castles – The two castles that extend at either side of La Caleta Beach are free to visit, and along with their historic significance (built in the 17th / 18th Centuries) Castillo De San Sebastian and Santa Catalina provide magical views of the city. Before revealing where I had some of my favourite meals, it’s worth remembering that this is Spain, and schedules are different! Breakfast is around 8/9am, around midday people might stop for a quick drink and a tapa, then lunch at 3pm and dinner around 9/10pm. Once I understood this Spanish way of life, it made sense that a lot of places are closed between 4pm – 8.30pm. 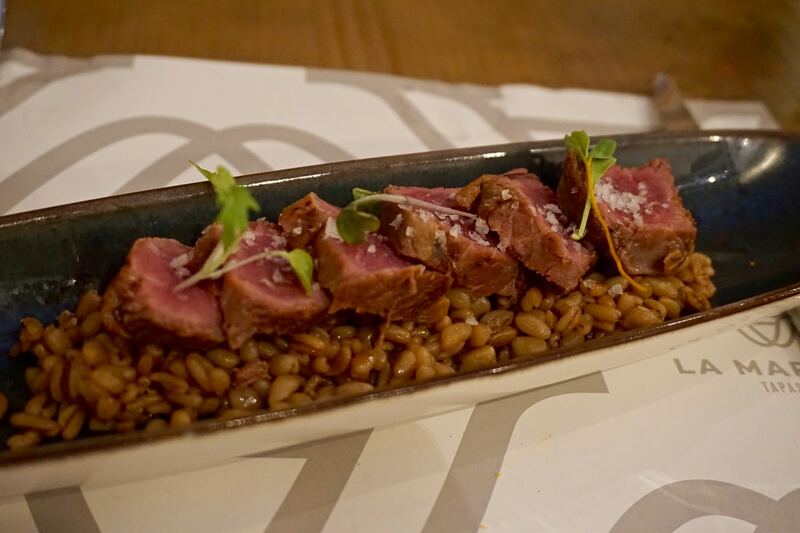 La Marmita Centro – This smart restaurant serves modern Spanish cuisine and for the best experience, I’d recommend choosing the tasting menu. 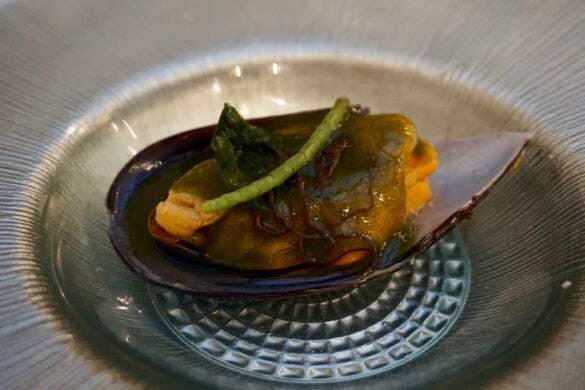 Dishes such as a cone of tuna and avocado tartar, mussels with seaweed, Iberian pork with bulgar wheat, and a dramatic Jack Daniels smoked pork came paired with tasty sherries and wines. Service was excellent, and I came away with new knowledge of the ingredients, dishes and wines. Casa Manteca – Cadiz’s most famous bar, this is a right of passage for anyone visiting the city. It’s lively, with walls covered in old pictures of Cadiz’s legendary carnival, bull fighting and more. Food is cheap and tasty, with the house speciality being chicharrones – a type of pressed pork served on waxed paper. I’d also recommend the roasted peppers stuffed with prawn and cod. La Candela – In contrast to the city’s numerous traditional restaurants, this one was quirky, arty and along with delivering great flavours, they also took pride in presentation. The croquettes were totally delicious, as was the marinaded tuna. It can get busy, so it’s best to book in order to guarantee a spot. Cafe Royalty – Lavish décor, paneling, accents of gold and beautifully-preserved murals make this historic café somewhere you just HAVE to visit. The café is famous for its picatostes – fried bread covered in sugar. I enjoyed them for a late breakfast one morning, with a strong coffee. Mesón Cumbres Mayores – Another popular haunt, this tapas bar shows off its hams by hanging them from the walls, the ceiling, and anywhere else they can fit them! Even the pumps for the cervezas look like legs of jamon! It’s laid back and traditional, and I’d recommend the solomillo presa and secreto. 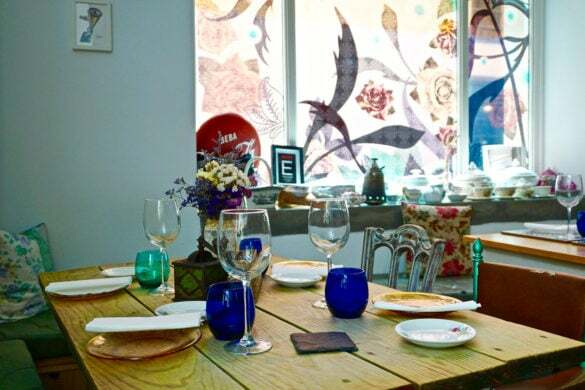 La Tabernita – Arrive before 9pm to grab one of the few tables in front of this popular tapas bar. For something new, try their cuttlefish meatballs (black from the ink) or their tortillitas de camarones (a baby shrimp fritter). 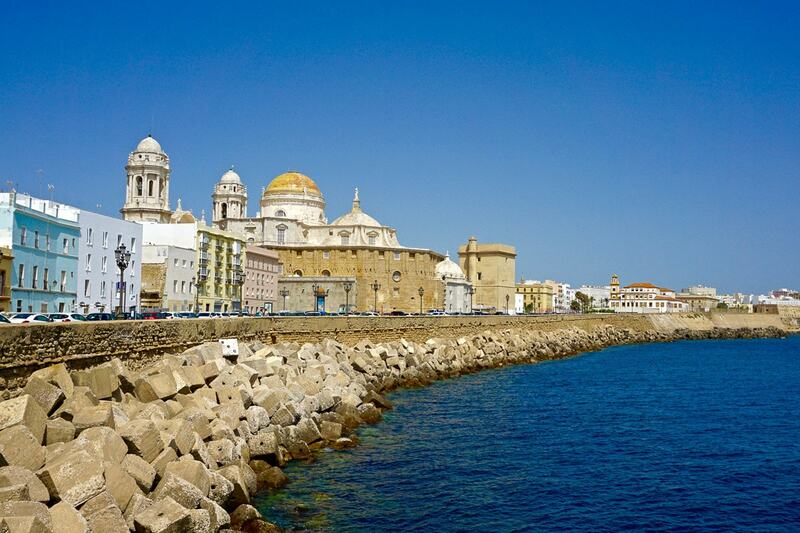 Bike tour of Cadiz: Join a small group tour and explore the beautiful city on two wheels. It’s a great way to get around, and by travelling with a knowledgable guide, you’ll learn lots as you go! 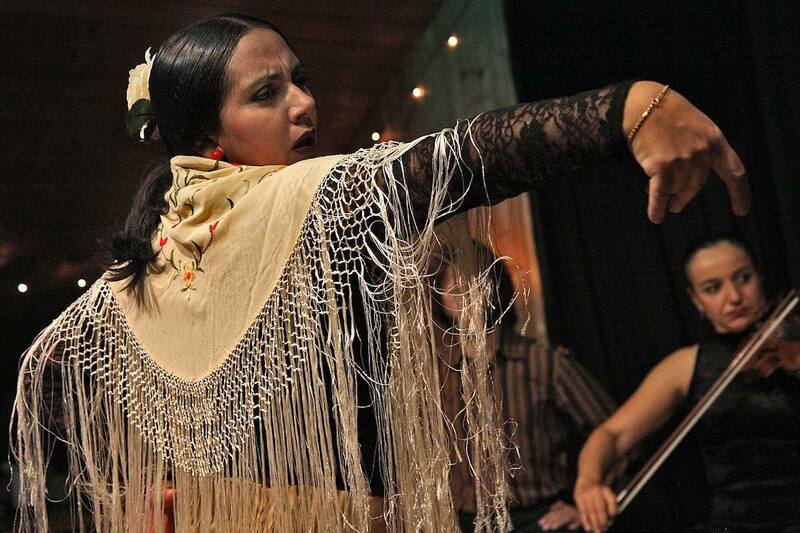 Flamenco Tablao Show in Cadiz: Check out a real flamenco show with live band in Cadiz’s warehouse district. The shows are always full of surprises and a really great part of Spanish culture. Horse Riding Tour of La Suara Natural Park in Cadiz: A beautiful part of Southern Spain where riders of all levels can explore the beautiful surroundings by horse. Expert guides will show you some of the most beautiful spots, and make you feel at ease! 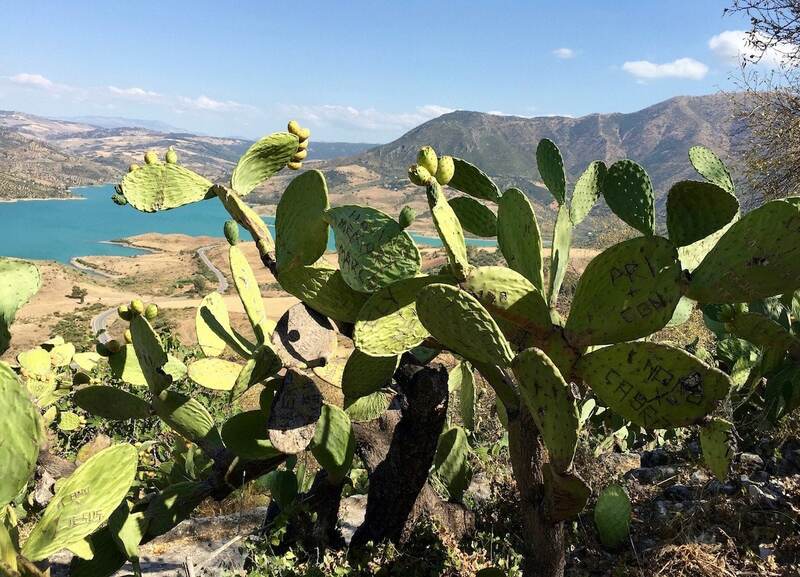 Hiking Day Trip to La Garganta Verde and Zahara de la Sierra from Cádiz: If you have time, a visit to see La Garganta Verde canyon and the mountaintop village of Zahara de la Sierra makes an amazing day trip! The tour included a 2-hour hike through the gorge, spectacular views of Zahara Castle and epic views of the 1,300-foot high canyon walls. Casa Patio del Panadero – I stayed here for the duration of my trip and the location was perfect for exploring the city on foot. The restored 19th-century building has a traditional Andalusian central patio, friendly staff, and my room had a sofa area and mini kitchen with fridge and microwave. Check prices and book here. Parador De Cadiz – One of the top-rated hotels in Cadiz, this smart oceanfront property is just 5 minutes walk from the beach. It has a spa, outdoor pool and beautiful sea views. If you’re looking for a smart place to stay in the city, definitely take a look! Occidental Cadiz – Just a few minutes away from Playa de la Victoria Beach, Occidental Cádiz has comfortable, spacious rooms. This hotel is in the new part of the city, so it’ll take you around 15 minutes to walk to the historic centre of Cadiz. Hotel Convento Cadiz – Stay in a little piece of Cadiz’s history at this converted convent! This stunning building dates back to 1635 and has a beautiful interior courtyard. It’s a beautiful place to stay, close to the cathedral and the stunning streets of the old city. Hotel Spa Cadiz Plaza – Another of the top rated hotels in Cadiz, this one is located in the new town opposite Playa de la Victoria Beach. Along with a fab location and modern rooms, the spa is a great selling point! Cadiz, Spain: Where To Visit Next? I’ve spent a lot of time exploring the south of Spain. Just last year I headed to Ronda (still one of my absolute favourite places in the whole world! ), Malaga, Nerja and Antequera. If you have a car, I’d recommend all of those, along with Seville, Granada and Cordoba. Each place is surprisingly different, has a unique cuisine and absolutely loads to see and do. Not far from Cadiz is Jerez, home of sherry, a bullfighting areana and a beautiful old town! If you’re staying in Cadiz, book a Cadiz to Jerez day trip to see all the sights. 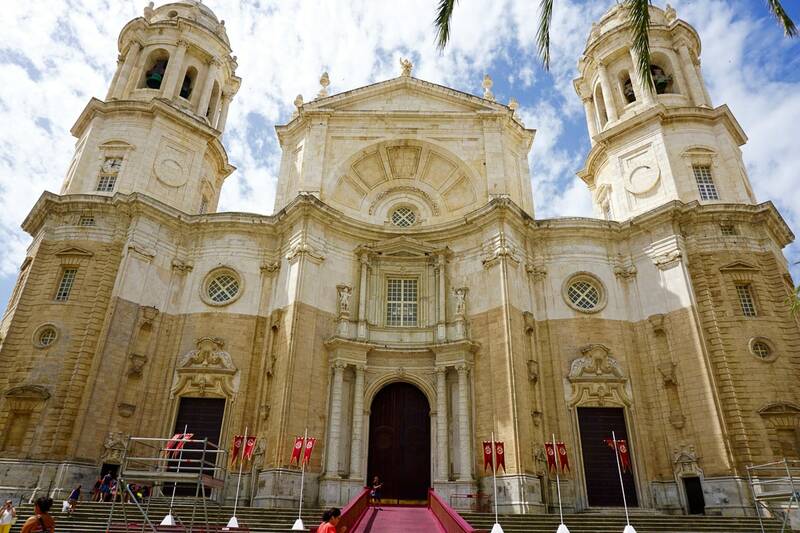 While it’s a little further, you can also book a Cadiz to Seville day trip, and spend the day exploring the ancient city, Cathedral, Plaza De Espana and more! This is nice. My wife and I are excited for the vacation we’ve booked in Europe to Spain and definitely we will go to the Canary. Tenerife is one of our eyeing place for our 1st stop 🙂 There so many thing we want to do from a page we’ve read https://www.canaryislandsinfo.co.uk/tenerife/things-to-do/.I wanted to know if you have experience traveling to this wonderful Island. Is there anything you can recommend aside from your past travel in in Spain? Hi Liroy! I’ve never visited Tenerife so can’t help there! But I adore Spain – it’s one of my fave countries. I’d recommend Cadiz, Seville, Barcelona and also a gorgeous town called Ronda if you can make it there too! Let me know how you get on! It’s totally worth a visit! Cadiz is just totally stunning! Cadiz looks gorgeous!! I’m obsessed with Spain at the moment!! Angie you would absolutely LOVE it! I know you’ve been to a few places in Spain lately including nearby Jerez, so definitely add it to your list! A really good overview Chloe. Parque Genoves is possibly my favourite spot too. I can’t believe I’ve missed the Amphitheatre though – wow! Thanks Ed – how could you miss that?! It’s incredible! That park was lovely, very quiet when I visited, compared to the busy beaches. Just loved Cadiz! We must admit, we were a little jealous of your posting to Cadiz – the beaches looked amazing and the city seems like a coastal marvel! Awesome guide, which we’ll hopefully use ourselves in the future! Thanks guys – I thought your trip looked great too. It’s been nice to get to know each city through different eyes! What a wonderful introduction to Cadiz! Great photos too. You have captured the magic of the city. Thanks Anne – that’s so lovely of you to comment. It was a wonderful weekend. I hope you manage to take a trip and follow in my footsteps soon! I visit all the time because I live close by Cadiz! Ah you’re so incredibly lucky! I’ll definitely be back soon! This is such an amazing guide to Cadiz! I can’t believe you got to see and do so much while you were there, and it looks like you chose a pretty perfect time for it too! Thank you! It really was a gorgeous trip – tonnes to see and do AND ALL THAT DELISH FOOD TOO!! I’ve had those recommended too! Definitely a reason to get back out there soon! Thank you! So pleased you found it helpful! our favorite place in Cadiz is Mercado Central because I love fresh seafood. If you love it too, you should visit. Ahhh I went and it was wonderful! So much life in one place!
! Hola! I love this city anyway but especially enjoyed reading your destination guide. I like how you’ve also portrayed yourself in the images (and they are good photos too- how did you manage that?). By the way, if you are ever in Oxford, please look me up for a complementary tour of Oxford. I run a wide range of tours but my special focus is on literary tours eg Jane Austen’s Bath, Shakespeare’s Stratford and Alice’s or Harry Potter’s Oxford. Thank you so much! I love Oxford too so will let you know if I visit again and have some free time! Hi Chloe. I’m headed to Cadiz in a few months. Where do you recommend for shopping? Would you suggest places to shop and items to purchase to remember my Cadiz trip? I like to buy small items for my home – not cheap gaudy keychains, etc. – but something that is handcrafted or unique to the area. And I usually find something to hang on our Christmas tree to remind us of our travels. Probably too late to post this. Just returned from Cadiz and found some wonderful shops in the centre but especially the artisan jewellery in the market. Very affordable too. Ah yes I remember some lovely places there! Thanks for commenting Sheila! This is a great guide to Cádiz! I work for a teacher training centre in the city and we’re always looking to encourage more people to come here – it’s still quite a hidden gem! Thank you!! I absolutely adored Cadiz and have recommended it to so many friends who have done Barcelona, Madrid, Malaga etc. Such a great city – you’re lucky to live there! 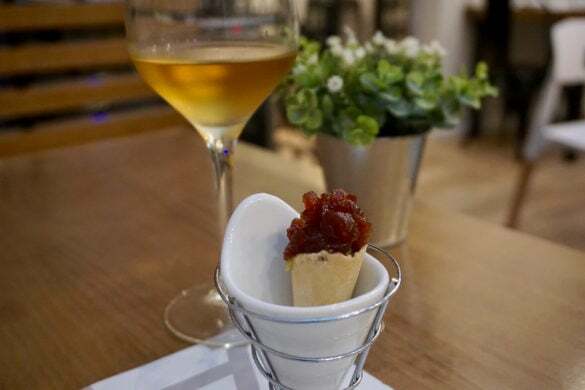 Thanks for the tip to try a food tour of Cadiz – Pablo of Cadizfornia gave us a brilliant tour of some of the tapas bars with lots of useful information and a really enjoyable evening. Highly recommended! Great article, thinking of visiting Spain in October. We would fly into Madrid from the US. What’s the best way to get to Cadiz from there? You could catch a train from there or hire a car – it’s not too tricky! Thanks for sharing your love of Cadiz, I visit Spain often and now thanks to you I will visit Cadiz soon. Cadiz looks amazing. Cheers!! Ah that’s amazing to hear – it’s one of my fave places in Spain! Heading to Jerez for 6 weeks beginning in August…. I found this information to be so helpful!!! Thanks so much and I cant wait to explore at eat and drink… BTW, my Spanish is quite limited, I am crash coursing now. Will I be okay without speaking fluent Spanish? Hi Nicole, You’ll be fine without fluent Spanish. Mine is very patchy but lots of people speak English or will be happy to help you. It’s such a great place. I hope you enjoy it! You hit multiple nails on the head with your guide. I visited about 90% of them as I write from the city itself. It’s so easy to get lost but find something interesting to see. Thanks for this. Hey Jamil – that’s so lovely to hear! I’m glad you loved the city as much as I did! Any idea where to spend new years with a very good dinner and orchestra and music and the whole experience at night. Family of 12, mostly in the 25-40 range. What a great post and you have captured Cadiz really well. . 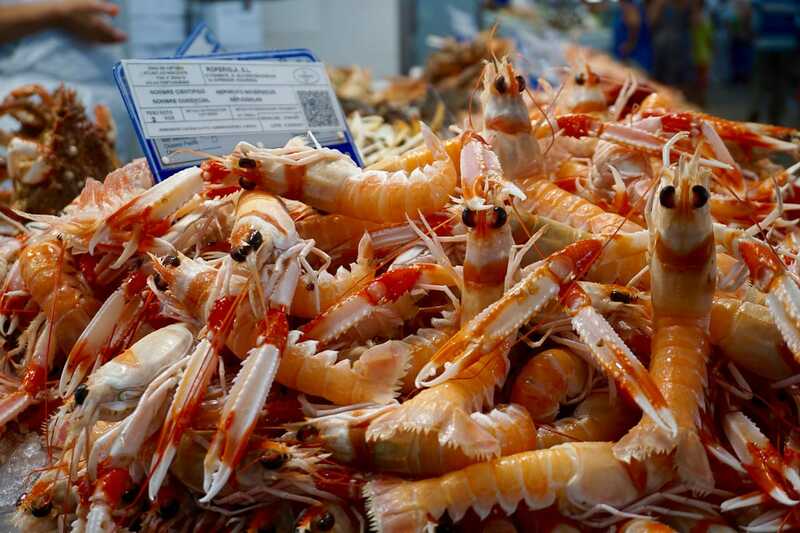 I would like to Visit Mercado Central because I love fresh seafood. Have a great trip Kristen! I’m coming to Spain in March and your article is exactly what I needed for research. Thank you so much, very informative and educational guide, Chloe! Thanks Tim – I hope you have a great trip! I love Cadiz!